Real-Time Map etc may be still better under "Visitors". 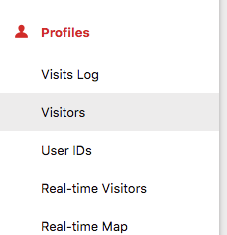 Renamed "Visitor Log" to "Visits Log" as this is more accurate, but could also keep the original name. The "Visitors" report is queried live and not archived as we would otherwise need to archive thousands or millions of rows to make this usable properly. :+1: for adding real time menu, also embedding the map would be awesome. Which map do you mean? visitor map or real time map? or both? FYI: We will keep this issue open for now as we want to see how we can make the profiles report useful as a real time report at some point. For regular report it wouldn't be fast enough unless we created archives for each sort column etc and kept eg only 1000 rows. Moving out of this milestone.